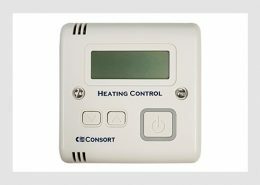 Our SL Wireless Control Heating System provides building owners or operators a variety of heating control options through four different wireless controllers connected to one or multiple SL heaters. The CRXSL, SLPB, SLVT and SLVTB single zone wireless controllers have been developed to make installation and setting up easy, and are compatible with a wide range of SL heaters including low surface temperature heaters. 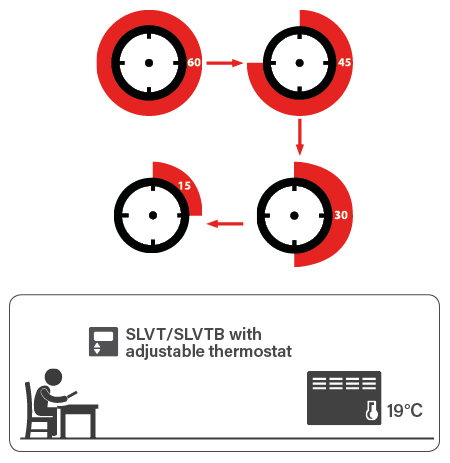 The SLPB, SLVT and SLVTB controllers feature a 4-stage run-back timer function where the heating period will stay active until the run-back timer expires. 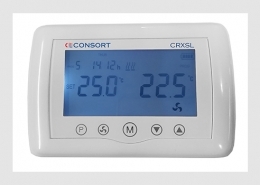 The CRXSL controller, on the other hand, has a programmable 7-day timer with 6 heating periods per day. The SL heating system is suitable for domestic and commercial premises such as homes, student accommodation, hotels, modular buildings and offices. Each SL controller is designed with functionalities aimed at restricting excessive energy consumption and improving heating efficiency. The SLPB, SLVT and SLVTB controllers have easy-to-use control buttons and will fit onto any standard one gang box. They are mains 240V or 12VDC powered except for the SLVTB which is battery-powered. The CRXSL controller can be powered either by a 5V power adapter with a micro USB connector, supplied power adapter via USB port or 4 AAA batteries. All SL controllers have comfort and setback temperature settings. A 4-stage run-back timer where a heating period remains active until the run-back timer expires. The SLVT controller has variable comfort control for user to adjust the temperature below the maximum comfort temperature. The CRXSL is powered by four ‘AAA’ whereas the SLVTB uses two ‘AAA’ batteries. Automatic, Manual temperature control and Fan only mode for RX fan heaters. Designed with an electronic lock to prevent tampering with controls. Only available with CRXSL controller. Offers a 7-day timer with 6 heating periods per day. 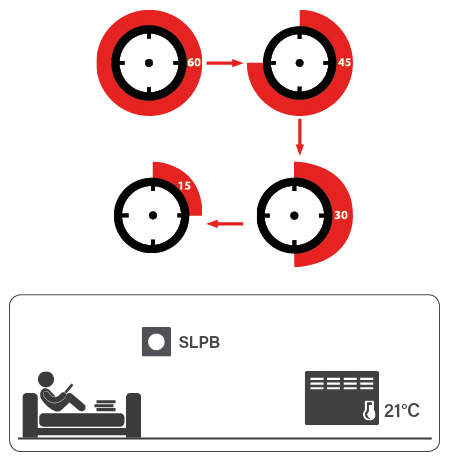 The 4-stage run-back timer function in the SLPB, SLVT and SLVTB controllers allows the heating to be active for a time period selected by users making it ideal for areas such as hotels or student accommodation. Users can activate the heating using the pre-set time segments set by the building owners or operators. There is a choice of three time segments available: 5, 15 or 30 minutes. When the main control button is pressed four times, this takes the run-back time period to 20, 60 or 120 minutes. Below illustrates how the run-back timer works on our three controllers. Example of the SLPB run-back timer active with four 15-minutes time segments selected by user. Temperature set at 21°C by building owner. User is unable to set temperature on the SLPB controller. Example of the SLVT or SLVTB run-back timer active with four 15-minutes time segments selected by user. Temperature set at 21°C by building owner. However, user is able to set comfort temperature at 19°C on SLVT/SLVTB controller. 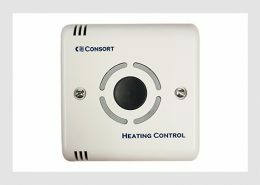 The SLVT and SLVTB allow users to set their comfort room temperature using the temperature control buttons, however, they cannot increase it beyond the maximum comfort temperature set by the building owners or operators.